Did everyone have fun ringing in the new year? We did. We hung out with some old friends, and made some new friends. It was a great time. We laughed and laughed and laughed. Not sure the Bocce Ball place completely appreciated us bringing in hats and noisemakers for our extra large group. Oh well, it was their first New Years Eve. They'll ask more questions next time before booking a group of 20. I'm making black eyed peas for us today. We didn't make any last year and boy do we regret that. I don't care if they taste like dirt. We're eating them. We're starting this year off right. 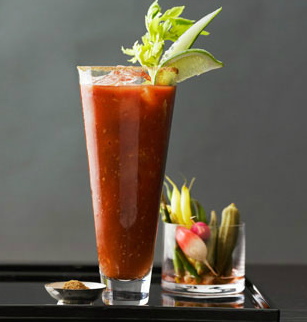 We'll wash them down with a Bloody Mary. There is nothing like the peppery tomato juice paired with vodka and yummy garnishes. I like a cocktail that is also a snack. Combine Bloody Mary mix and vodka in a pitcher with ice. 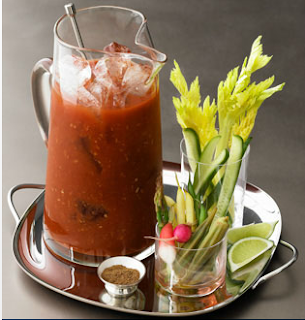 Set out glasses, ice and garnishes in bowls or cups. Let your guests make their own. Love the idea! Didn't know quite what to do with the ZingZang. Had a Bloody Mary in Springfield, MO and they made it with ZZ. Thanks Kris!! !